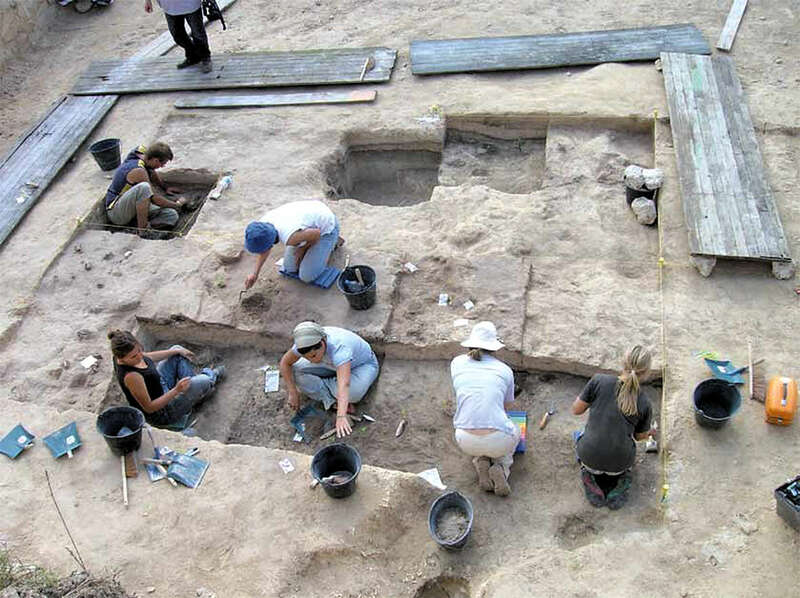 The story of the period to become known as the Acheulian, after the eponymous site of Saint Acheul, began with the excavations of Boucher de Perthes in the nearby area of Abbeville. These sites are in the lower Somme valley, and were ideal for the study of the period, since there is a separation between the Old Stone Age of the Acheulian, and the later deposits of the Neolithic in peat bogs which covered much of its surface. 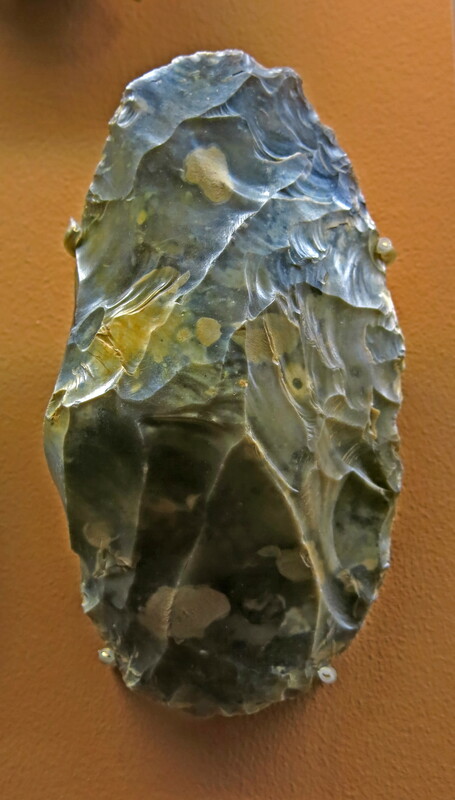 The Pleistocene deposits containing the distinctive large hand axes of the period were in terraces which resulted from alternating cycles of stream deposition and down-cutting allied to changes in climate and sea level that accompanied the alternating glacial and interglacial stages of Pleistocene times. These deposits attracted early researchers, who found not just the hand axes, but also the bones of what were identified as elephants and rhinoceroses. In 1842 Boucher de Perthes began examining the quarries excavated into stream terraces around Abbeville, gradually building up a collection of hand axes that supposedly had been recovered from the strata that also produced fossil elephants and rhinoceroses. He had found the proof of human antiquity. 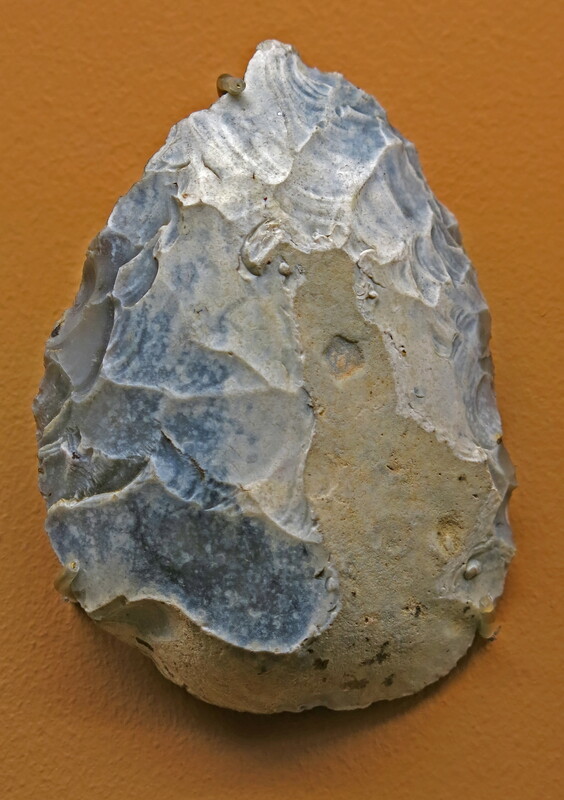 In the process he had developed the rudiments of a stratigraphically-based science of terrace research, which he very aptly termed ‘geo-archaeology’. By 1847 he had completed the first edition of his Les Antiquités Celtiques et Antédiluviennes (Celtic and Antediluvial Antiquities). The book was poorly written and was badly received. 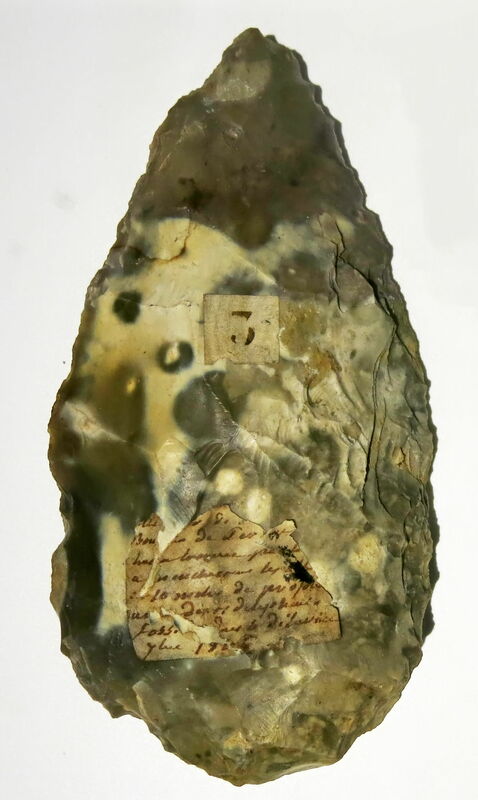 The collection of Boucher de Perthes was eventually placed in the Musée d'Archeologie Nationale et Domaine, St-Germain-en-Laye after it was discreetly purged of the many fakes which his workmen sold him. 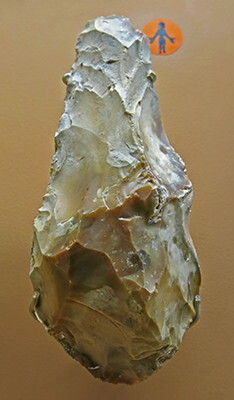 Acheulean hand axe from the collection of Jacques Boucher de Perthes and Edouard Lartet. Autograph note of Boucher de Perthes and Lartet. This specimen has figured in the Exposition Universelle from 1867 in Paris. Age: 500 000 to 300 000 BP. Former collection of Jacques Boucher de Perthes and Edouard Lartet. Autograph note of Boucher de Perthes and Lartet. This specimen has figured in the Exposition Universelle from 1867 in Paris. 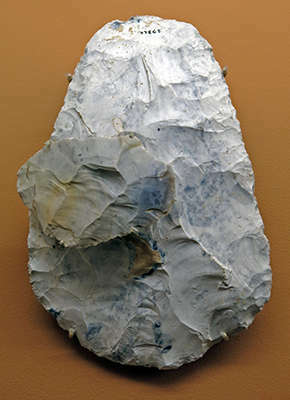 Lower Palaeolithic Acheulian lanceolate biface hand axe, from Somme. Length 147 mm, width 73 mm, thickness 29 mm. A few years after Boucher de Perthes had made his discoveries, gravel quarries in the suburb of Saint-Acheul in Amiens in turn delivered a large number of flints characterised by the presence of bifaces, flint tools fashioned on both sides. 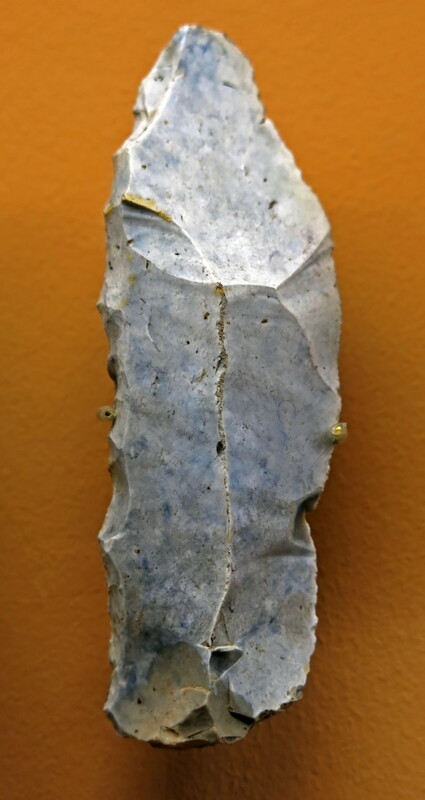 The site of St. Acheul became a reference site of international renown. 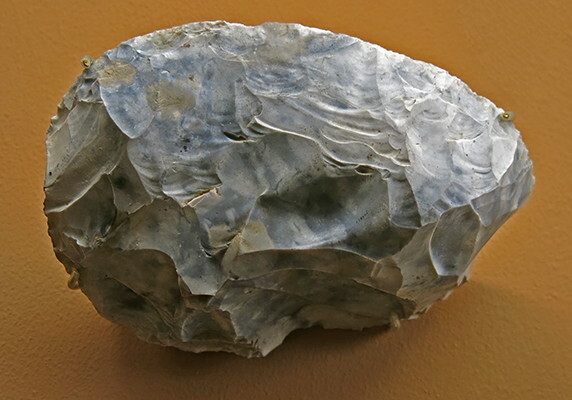 In 1872, the prehistorian Gabriel Mortillet used the term Acheulean to describe the flint industry of these deposits. Victor Commont (1866-1918), Amiens prehistorian and director of the Ecole Normale d'Amiens, is responsible for the bulk of the early scientific study of the deposit of St. Acheul. The collected primitive industry reflects the earliest occupations of the man in the valley of the Somme, from 450 000 years ago. The distance between the contours is 5 metres. (left) Biface from Saint-Acheul (Somme). 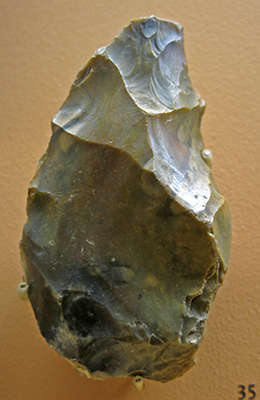 (right) Biface-support from Saint-Acheul (Somme). 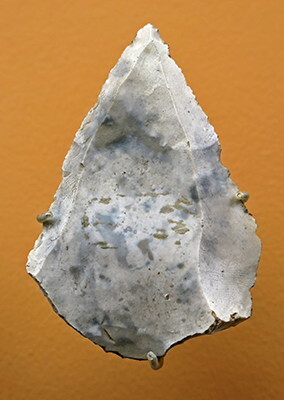 (left) Biface on a flake from Saint-Acheul. 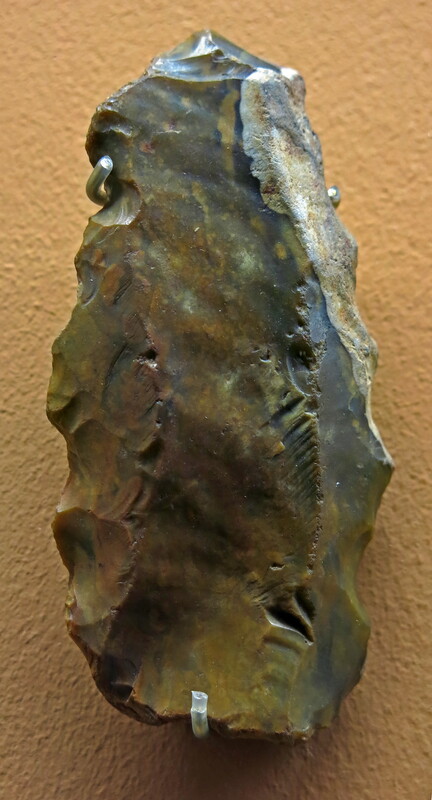 (right) Racloir (scraper) on a Levallois flake from Saint-Acheul. (left) Backed knife on a Levallois flake from Saint-Acheul. (right) Levallois point from Saint-Acheul. 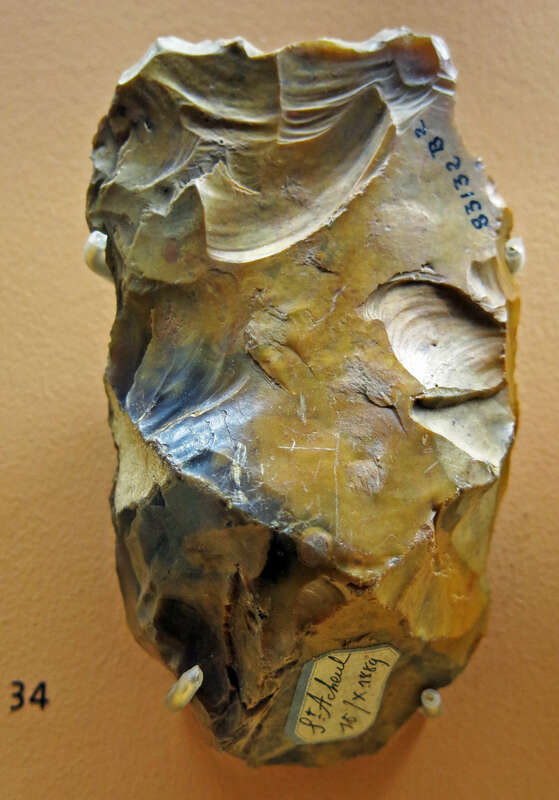 (left) Racloir on a retouched flake from Nappe de la Garenne (Garenne Formation). 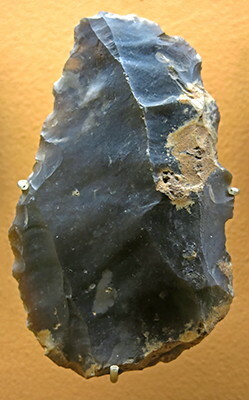 (right) Biface from Nappe de la Garenne. Denticulés (denticulates) from Nappe de la Garenne (Garenne Formation). 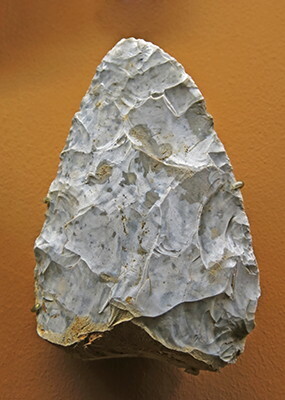 (right) Biface-support, a piece with the general form of a biface handaxe, but extensively changed, either to fulfil another purpose, or as a source of flakes from a good flint nucleus when the original biface has been damaged. 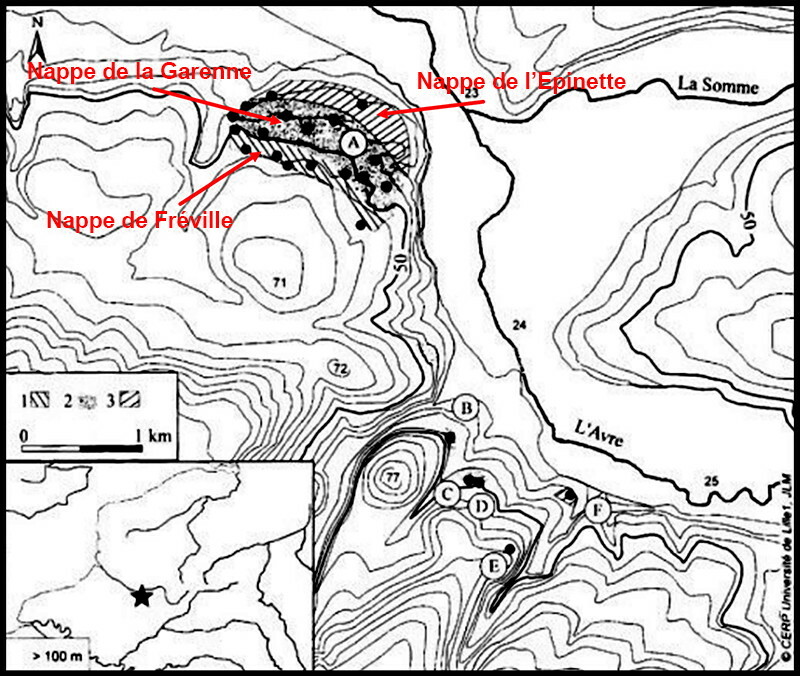 From Nappe de la Garenne. 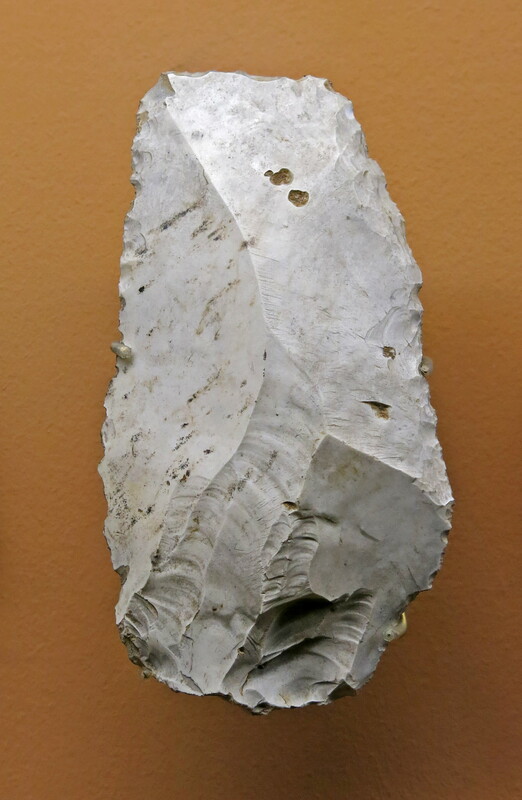 Biface-supports from Nappe de Fréville (Fréville Formation). 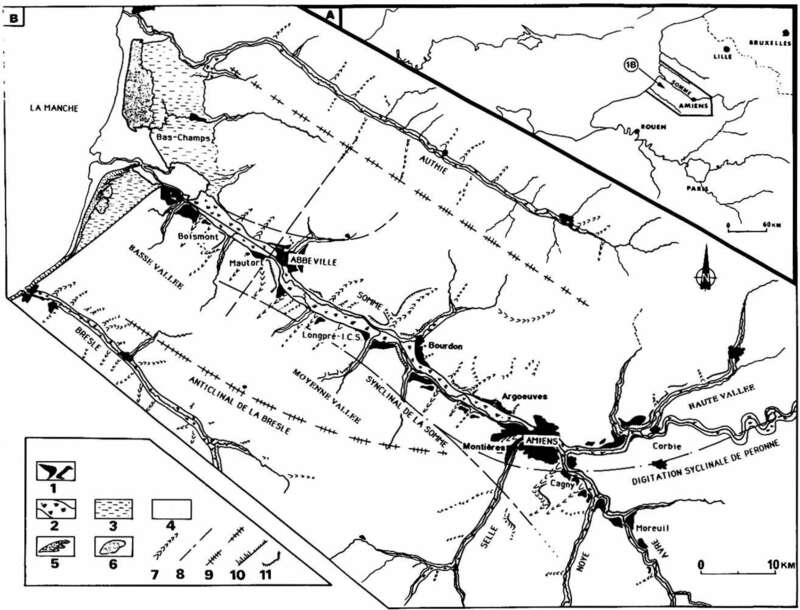 Pierre, A., 1993: Le système de terrasses du Bassin de la Somme: Modèle d'évolution morpho-sédimentaire cyclique et cadre paléoenvironnemental pour le Paléolithique, Quaternaire, Volume 4 - Numéro 1 - 1993. pp. 3-16.